The oral cavity contains some of the most varied and vast flora in the entire human body and is the main entrance for two systems vital to human function and physiology, the gastrointestinal and respiratory systems. Several diseases involve these two systems and manifest in the oral cavity. In addition, a specific pathologic condition, such as periodontitis (ie, inflammation of the periodontal attachment of the teeth and the alveolar bone), may be present in the oral cavity. These specific conditions in the oral cavity may create foci of infection that can affect many other vital systems, such as the cardiovascular and renal systems. Foci of infection in the oral cavity arising from chronic periodontitis or chronic periapical abscesses (ie, inflammation and abscess of the tissue attached to the apex of the root) may lead to subacute bacterial endocarditis (BE) and glomerulonephritis (GN). In addition to bacterial organisms, oral microorganisms can include fungal, protozoal, and viral species. The bacteria include hundreds of types of organisms of which only "22 predominant ones have been identified." A variety of organisms in the microenvironment of the oral cavity adhere to the teeth, the gingival sulcus, the tongue, and the buccal mucosa. Each site has a unique way of allowing the organisms to establish their residency. The normal flora in healthy individuals maintains similar patterns. When a local or systemic disease process or concomitant use of medications alters this overall pattern, atypical organisms begin to predominate and some normal organisms with a benign nature, such as Candida albicans, become pathogenic. The microenvironment of the oral cavity changes with the age of the patient, the eruption or loss of teeth, and the appearance of disease states (eg, caries, periodontal disease). Systemic changes, such as pregnancy or drug intake, also alter the number and proportion of flora. These changes are due to alterations in the flow and composition of salivary fluid and in the levels and activity of defense components (eg, immunoglobulins, cytokines) in the saliva. Increasing evidence indicates that oral microbiota participate in various systemic diseases. Periodontal disease permits organisms to enter deep systemic tissues, such as the carotid atheroma. An association between periodontal pathogens, such as Porphyromonas gingivalis, and atherosclerosis has been suggested because of the pathogen's possible direct effect on atheroma formation. 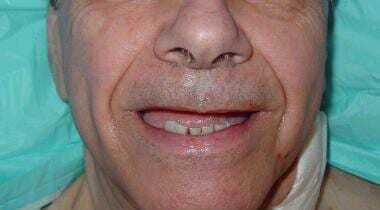 P gingivalis has also been found in carotid and coronary atheromas. It may also invade and proliferate within heart and coronary artery endothelial cells, and, along with Streptococcus sanguis, it may also induce platelet aggregation associated with thrombus formation. Oral microorganisms may also enter the deeper tissue after trauma or surgery, which contributes to the disease process, particularly when they cause BE. Periodontitis is a common chronic bacterial infection of the supporting structures of the teeth. The host response to this infection is an important factor in determining the extent and severity of the disease. Systemic conditions may modify the extent of periodontitis principally through their effects on normal immune and inflammatory mechanisms. Several systemic diseases, such as diabetes mellitus, may increase the prevalence, incidence, or severity of gingivitis and periodontitis. Medications such as phenytoin, nifedipine, and cyclosporin are known to predispose to gingival overgrowth and to increase the severity of plaque formation. Immunosuppressive drug therapy and any disease (eg, HIV infection) resulting in suppression of the normal inflammatory and immune mechanisms can cause or enhance severe periodontal diseases. Smoking, which has an adverse effect on periodontal health, also affects this overall disease condition. Specific diseases, such as histiocytosis, may result in necrotizing ulcerative periodontitis. The severity and prevalence of periodontitis are increased in persons with diabetes and are worse in persons with poorly controlled diabetes. Periodontitis may exacerbate diabetes by decreasing glycemic control. This effect indicates a degree of synergism and a link between the 2 diseases. The relative risk of cardiovascular disease is doubled in persons with periodontal disease. Periodontal and cardiovascular disease share many common risk and socioeconomic factors, particularly smoking, which is a powerful risk factor for both diseases. The actual underlying etiology of both diseases is complex, as are the potential mechanisms whereby the diseases may be causally linked. The chronic inflammatory state and microbial burden in persons with periodontal disease may predispose to cardiovascular disease in ways proposed for other infections, such as with Chlamydia pneumoniae. 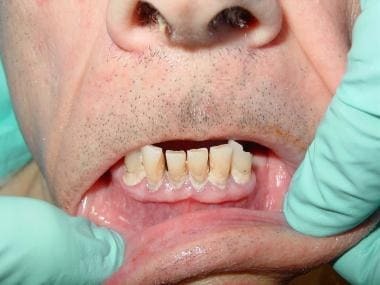 A 72-year-old man with severe periodontal disease (same patient as in Media Files 2-6). 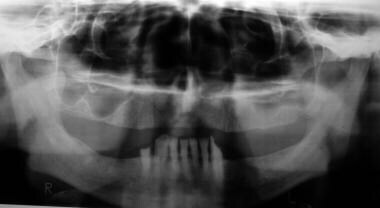 Radiographically evident severe alveolar bone loss and periodontitis (same patient as in Media Files 1 and 3-6). Carotid duplex ultrasonogram exhibits severe atherosclerosis/stenosis of the left carotid artery (same patient as in Media Files 1-2 and 4-6). Status post left carotid endarterectomy (same patient as in Media Files 1-3 and 5-6). Gross pathologic specimen shows carotid plaque as cause of stenosis (same patient as in Media Files 1-4 and 6). 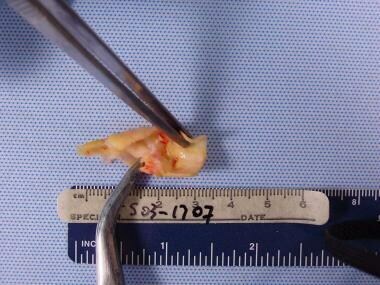 Dissected pathologic carotid plaque with bacterial contents similar to periodontal plaque surrounding existing dentition (same patient as in Media Files 1-5). For patient education resources, see the Teeth and Mouth Center, as well as Gingivitis and Periodontal (Gum) Disease. Also of interest may be the articles Viral Infections of the Mouth and Noncandidal Fungal Infections of the Mouth. Dental manipulation has been proven to cause transient bacteremia. Patients who have congenital or acquired cardiovascular defects are at risk for bacterial endocarditis (BE). Before the antibiotic era, these infections were fatal. Today, even with the best medical treatment, this disease has a mortality rate of 10-80%. The lesion of BE is a vegetation that develops on a heart valve. BE is relatively rare, with a worldwide incidence of 10-60 cases per 1 million persons per year. However, this rate is low considering the more susceptible group of patients with rheumatic fever and those with a previous history of endocarditis; these patients have a 10-30% risk of developing BE. However, only 200 cases of streptococcal endocarditis following dental and genitourinary tract procedures have been reported in the literature. Infective endocarditis occurs when microorganisms enter the bloodstream and infect damaged endocardium or endothelial tissue. It most commonly involves the heart valves (either native or prosthetic), but it may also occur at the site of a septal defect, on the chordae tendineae, or on the mural endocardium. The prototypic lesion is at the site of the infection; the vegetation is a mass of platelets, fibrin, microcolonies of microorganisms, and scant inflammatory cells. Endocarditis is classified as acute or subacute, which applies to the features and the progression of infection until diagnosis. The rate of endocarditis occurring in an at-risk patient after receiving dental treatment can vary depending on the patient’s periodental diseases. Numerous studies have demonstrated that bacteremia after dental procedures can cause bleeding in 50-90% of patients. Patients with oral bacteremia who do not receive antibiotic treatment can have a mortality rate of 100%. Those treated have a mortality rate of 10-80%; patients with early prosthesis valve endocarditis have the highest mortality rate. Morbidity can include congestive heart failure, renal disease, stroke, and scarred heart valves. The oral cavity, the skin, and the upper respiratory tract are the primary portals for Streptococcus viridans; Staphylococcus species; and Haemophilus aphrophilus, Aggregatibacter (formerly Actinobacillus) actinomycetemcomitans,  Cardiobacterium hominis, Eikenella corrodens, and Kingella kingae (HACEK) organisms,  with streptococcal and staphylococcal organisms responsible for more than 80% of cases of BE. The lesions usually manifest as cardiac, embolic, or general lesions. Cardiac lesions are usually valvular, with vegetative lesions occurring on the line of contact with damaged valve cusps. The mitral valve is usually the most commonly affected, involving 28-45% of patients with BE. Endothelial injury causes aberrant flows and allows either direct infection by virulent organisms or the development of an uninfected platelet-fibrin thrombus (nonbacterial thrombotic endocarditis). This thrombus serves as a site of bacterial attachment during transient bacteremia. Septic emboli can manifest as congestive heart failure with infection-induced valvular damage and splenomegaly and splenic abscesses. Neurologic manifestations, such as delirium, headache, and meningeal irritation, may be caused by mycotic aneurysms. Other generalized lesions can cause myalgias, anorexia, backache, fever, chills, sweats, Osler nodes, Janeway lesions, and splinter hemorrhages with clubbing of the fingers. Persons at greatest risk are patients with prosthetic heart valves, previous infective endocarditis, cyanotic congenital heart disease, aortic valve disease, mitral regurgitation, patent ductus arteriosus, ventricular septal defect, or coarctation of the aorta and those who use intravenous drugs. Because of the high morbidity and mortality rates associated with BE, antibiotic prophylaxis is recommended before selective procedures likely to produce bacteremia and endocarditis, as is maintaining good dental hygiene and aggressively treating local infections. The benefits of antibiotic prophylaxis are not established, and, in fact, only 50% of patients with native valve endocarditis know they have a valve lesion predisposing to infection. Organisms not targeted by prophylaxis cause more than 35% of infections. Dental treatments are the procedures most widely accepted as predisposing to endocarditis; however, they are no more frequent during the 3 months preceding this diagnosis than in uninfected matched controls. The administration of antibiotic prophylaxis to at-risk patients who are undergoing dental manipulations is a reasonably well-accepted clinical practice. The most frequently used guidelines are those of the American Heart Association (see Endocarditis Prophylaxis Information) and the British Society of Antimicrobial Chemotherapy. Numerous studies have demonstrated that antibiotics can reduce the prevalence and the magnitude of bacteremia. Patients who are susceptible may be able to reduce the risk of endocarditis by maintaining good dental hygiene and aggressively treating local infections. The antibiotic regimen for prophylaxis of endocarditis in adults at moderate or high risk is described below. The standard regimen (low-to-moderate risk) is amoxicillin at 2 g orally 1 hour before the procedure. If the patient cannot take oral medication, us ampicillin at 2 g intravenously or intramuscularly within 30 minutes of the procedure. It is important to note that sterilization of dental instruments by dental or medical practitioners is very important in preventing subacute BE. This author is being involved as an expert witness to review the onset of subacute BE in 15 patients from an office of a single practitioner. Oral infections may directly contribute to atherogenesis and thromboembolic events by providing repeated systemic vascular challenges of proinflammatory cytokines, periodontal pathogens, and lipopolysaccharide (LPS). The proinflammatory cytokines may be more closely associated with the more chronic aspects of cardiovascular disease, such as the formation and the progression of arterial plaques, whereas the microbial and the LPS exposures may be associated with the more acute aspects of coronary heart disease and stroke, such as thrombus formation. Acute episodes of an infectious disease may play a role in precipitating an acute cardiovascular event. The infection with the largest body of evidence to support an association with cardiovascular disease and cerebrovascular disease is infection with C pneumoniae. Most of the 30 retrospective and cross-sectional studies show an association between C pneumoniae antibodies and cardiovascular disease. Sufficient evidence from biological mechanisms and animal models warrant interventional studies on periodontitis and the development of cardiovascular events. C pneumoniae and its LPS can enhance low-density lipoprotein accumulation in human-derived monocytes to form foam cells, which are a key component of atherosclerosis. Microorganisms can infect vascular endothelial cells directly, initiating the inflammatory response needed for the initial process of inducing atherosclerosis and for accelerating or enhancing this process. CRP is also an independent risk factor for cardiovascular disease. CRP localizes with complement in human hearts during MIs, suggesting that CRP binds to diseased muscle tissue, fixes complement, and triggers complement-mediated inflammation that contributes to atheroma formation. Periodontal infections may be associated with an increased risk of atherosclerotic processes, such as coronary artery disease and strokes, because of the association of periodontal infections with elevated levels of CRP. The accumulation of epidemiologic, in vitro, and animal evidence suggests more than just a casual role of periodontal infections as a risk factor for cardiovascular disease and stroke. People with severe periodontitis have the strongest link to cardiovascular disease and cerebrovascular disease. These people also have the greatest amounts of pathogenic bacteria and systemic factors that may contribute to an altered immunoinflammatory response. In patients with poor oral hygiene and in the presence of oral foci of infection, renal involvement is characterized by the abrupt onset of hematuria and proteinuria and is often association with edema, hypertension, and mild-to-moderate renal insufficiency. The disease usually develops several days after Streptococcus mitis or Streptococcus mutans bacteremia. However, several reported cases indicate that renal disease is not caused by streptococci but is associated with a bacteremic state or with viral or parasitic diseases. In the early phases of bacterial infection, diffuse glomerular, mesangial, and endothelial cell proliferation is present and is associated with infiltration of the capillary lumens by polymorphonuclear leukocytes and mononucleotide cells. Extracapillary proliferation may involve a few glomeruli, whereas diffuse and extensive circumferential crescent formation is uncommon, although possible. Inflammatory cells expressing IL-8 and transforming growth factor-beta (TGF-beta) appear to increase the expression of intercellular adhesion molecules, which can be found in both glomerulus and interstitial sites. IL-8 levels are correlated with glomerular neutrophil infiltration, whereas TGF-beta levels are correlated with mesangial matrix proliferation. The tubulointerstitial compartment is usually normal, but, in most proliferative forms, acute cellular infiltrates can be seen. The typical immunohistologic pattern is characterized by abundant and well-defined granular deposits of C3 along the outer aspects of the glomerular capillary walls. These deposits confer the appearance known as starry sky. Immunoglobulin G and immunoglobulin M are present in 60-70% of cases. C1q and C4 are generally lacking. Fibrinogen is seen only in crescents. With electron microscopy, coarse electron-dense subepithelial deposits are the distinguishing feature of GN. Because of their shape, the deposits are defined as humps. However, intramembranous and subendothelial deposits and mesangial deposits can also be found. In later phases of the disease, endocapillary proliferation and polymorphonuclear infiltration are less evident and prominent mesangial deposits can be observed. In other cases, subepithelial deposits are confluent, so that apparently elongated deposits, which confer a flarelike pattern immunohistologically, replace the humps. In cases without complete resolution, the typical endocapillary disease can transform over time into a mesangiocapillary pattern. Some data suggest that GN is an immune-complex disease in which some components of nephritogenic streptococci likely act as antigens. Cell membrane antigens, streptococcal cationic proteinase, extracellular plasmin-binding protein, and endostreptosin or preabsorbing antigen have been proposed as possible triggers for the formation of the immune complexes. On the other hand, antiimmunoglobulin antibodies could be involved in the pathogenesis of GN, as demonstrated by the high titers of rheumatoid factor and by the presence of antiimmunoglobulin deposits in renal biopsy specimens of some patients. An important role in conferring antigenicity to immunoglobulins can be played by another streptococcal component, the neuraminidase. In fact, this component can cause consequent modifications of autologous immunoglobulins; moreover, neuraminidase can alter leukocytes and favor their deposition in the glomeruli and the interstitium. Cellular immunity may also be involved in the pathogenesis of GN, as suggested by glomerular and interstitial infiltration of granulocytes, monocyte/macrophages, and T lymphocytes; increased IL-8 and TGF-beta levels in the kidneys; and increased IL-6 and tumor necrosis factor-alpha levels in the circulation. The typical patient with GN presents with an acute nephritic syndrome (ie, oliguria, edema, hypertension, gross hematuria) 10-21 days after the onset of bacteremia. Nonspecific symptoms, such as malaise, weakness, and nausea, are frequent. Dull lumbar pain is present in 5-10% of patients. Although rare, an extrarenal disease is possible in patients with GN, as demonstrated by the association with oliguria, scleritis or cerebral palsy in elderly patients, and vasculitis. In other patients, GN can be asymptomatic and cause only a transient serum complement decrease and/or mild urinary abnormalities, such as isolated microscopic hematuria, with or without hypertension. Prospective studies in families have shown that this presentation is more common than the overt clinical presentation described above. Very rarely, GN is associated with urinary abnormalities in spite of clinical symptoms and the presence of endocapillary GN at biopsy. Usually, the nephritic symptoms spontaneously reverse 4-7 days after the onset; however, urinary changes, mild renal function impairment, or hypertension can persist or develop months or years after the acute episode. These abnormalities can be found in approximately 20% of patients 1-2 decades after the onset. Usually, children do better than adults. Patients with a nephrotic syndrome at presentation and those with extensive deposits in the peripheral capillary loops have a worse prognosis. Patients with crescentic disease may recover spontaneously. However, the prognosis is poor when crescents involve 60% of glomeruli. In some patients with a subclinical presentation, persistent or intermittent microscopic hematuria may be seen at long-term follow-up examinations. GN results in increased antistreptolysin titers and decreased C3 levels. Increased antistreptolysin titers are observed in 40-90% of patients with GN. With GN, more than 90% of patients have a decrease in C3 levels and normal C4 serum levels, indicating an activation of the alternative pathway of complement. In most cases, C3 levels return to normal in less than 8 weeks, even though a prolonged decrease of C3 levels is possible. The behavior of complement distinguishes GN from other renal diseases, such as lupus nephritis, in which both C3 and C4 levels are usually reduced in active phases. In type 2 cryoglobulinemic nephritis, usually only the C4 level is strongly decreased. Usually, no extrarenal symptoms are present in persons with GN besides edema and hypertension. These features differentiate GN from systemic diseases that cause acute nephritic syndrome. However, keep in mind that in occasional patients with GN, extrarenal symptoms (eg, scleritis, cerebral vasculitis) may be present. GN can be easily diagnosed in epidemic or family cases, even when only transient and minor clinical and urinary changes are present. However, for sporadic cases with only persistent urinary abnormalities, distinguishing between immunoglobulin A nephropathy, thin basement membrane disease, and other conditions can be difficult without performing a renal biopsy. However, a typical history and clinical picture in most patients with acute nephritic syndrome caused by GN make diagnosis easy; thus, a confirmatory biopsy is not needed. Renal biopsy may be indicated for patients with an atypical history or presentation and especially for patients with severe or prolonged renal failure, which can be caused by crescentic disease. The primary goals of treatment are to eliminate oral foci of infection and to manage oliguria, edema, and hypertension. Renal management includes restriction of sodium and fluid intake. Furosemide or other loop diuretics are frequently needed. In many patients, hypertension reverses with the correction of fluid overload and edema. However, in some patients, antihypertensive agents are needed. Antistreptococcal antibiotics, such as penicillin, cephalosporins, erythromycin, or derivatives, should be given. Corticosteroids or immunosuppressive agents are not indicated in persons with GN because the disease spontaneous resolves in most cases. However, in patients with extensive crescent formation and slow resolution of symptoms, a short course of high-dose glucocorticoids may be considered. Maintaining good long-term oral hygiene is required in patients with glomerulonephritis (GN) and in patients with bacterial endocarditis (BE) and atherosclerotic cardiovascular disease. Elimination of oral foci of infection as potential sources of bacterial seeding is essential for persons with any of the conditions discussed. Dietrich T, Webb I, Stenhouse L, Pattni A, Ready D, Wanyonyi KL, et al. Evidence summary: the relationship between oral and cardiovascular disease. Br Dent J. 2017 Mar 10. 222 (5):381-385. [Medline]. Topazian RG, Goldberg MH, Hupp JR, eds. Oral Maxillofacial Infections. 4th ed. Philadelphia, Pa: WB Saunders; 2002. Mougeot JC, Stevens CB, Paster BJ, Brennan MT, Lockhart PB, Mougeot FK. 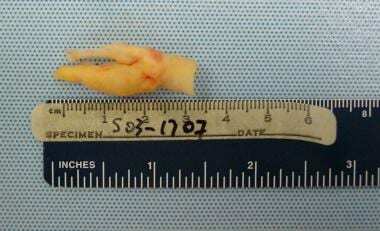 Porphyromonas gingivalis is the most abundant species detected in coronary and femoral arteries. J Oral Microbiol. 2017. 9 (1):1281562. [Medline]. Little JW, Miller CS, Rhodus NL, Falace D, eds. Dental Management of the Medically Compromised Patient. 6th ed. St. Louis, Mo: Mosby; 2002. Braunwald E, Fauci AS, Kasper DL, et al, eds. Harrison's Principles of Internal Medicine. 15th ed. New York, NY: McGraw-Hill; 2001. Drangsholt MT. A new causal model of dental diseases associated with endocarditis. Ann Periodontol. 1998 Jul. 3(1):184-96. [Medline]. Hogevik H, Olaison L, Andersson R, Lindberg J, Alestig K. Epidemiologic aspects of infective endocarditis in an urban population. A 5-year prospective study. Medicine (Baltimore). 1995 Nov. 74(6):324-39. [Medline]. Everett ED. Complications and residuals of meningococcal disease. Mil Med. 1971 Jul. 136(7):612-6. [Medline]. Dajani AS, Taubert KA, Wilson W, Bolger AF, Bayer A, Ferrieri P, et al. Prevention of bacterial endocarditis. Recommendations by the American Heart Association. JAMA. 1997 Jun 11. 277(22):1794-801. [Medline]. Peterson LJ, Peacock R. The incidence of bacteremia in pediatric patients following tooth extraction. Circulation. 1976 Apr. 53(4):676-9. [Medline]. Lampe AS, Schroijen MA, Smith SJ. [Endocarditis due to Aggregatibacter (formerly: Actinobacillus) actinomycetemcomitans, a bacterium that grows in characteristic star-shaped colonies]. Ned Tijdschr Geneeskd. 2008 Apr 5. 152(14):827-30. [Medline]. Beck JD, Slade G, Offenbacher S. Oral disease, cardiovascular disease and systemic inflammation. Periodontol 2000. 2000 Jun. 23:110-20. [Medline]. Shively BK, Gurule FT, Roldan CA, Leggett JH, Schiller NB. Diagnostic value of transesophageal compared with transthoracic echocardiography in infective endocarditis. J Am Coll Cardiol. 1991 Aug. 18(2):391-7. [Medline]. Hall G, Nord CE, Heimdahl A. Elimination of bacteraemia after dental extraction: comparison of erythromycin and clindamycin for prophylaxis of infective endocarditis. J Antimicrob Chemother. 1996 Apr. 37(4):783-95. [Medline]. Baltch AL, Pressman HL, Hammer MC, Sutphen NC, Smith RP, Shayegani M. Bacteremia following dental extractions in patients with and without penicillin prophylaxis. Am J Med Sci. 1982 May-Jun. 283(3):129-40. [Medline]. Centers for Disease Control and Prevention. Infection Control - Disinfection and Sterilization. Available at https://www.cdc.gov/infectioncontrol/guidelines/disinfection/index.html. December 28, 2016; Accessed: September 26, 2017. Genco R, Offenbacher S, Beck J. Periodontal disease and cardiovascular disease: epidemiology and possible mechanisms. J Am Dent Assoc. 2002 Jun. 133 Suppl:14S-22S. [Medline]. Fong IW. Infections and their role in atherosclerotic vascular disease. J Am Dent Assoc. 2002 Jun. 133 Suppl:7S-13S. [Medline]. Arbes SJ Jr, Slade GD, Beck JD. Association between extent of periodontal attachment loss and self-reported history of heart attack: an analysis of NHANES III data. J Dent Res. 1999 Dec. 78(12):1777-82. [Medline]. Genco RJ, Wu TJ, Grossi S, et al. Periodontal microflora related to the risk for myocardial infarction: A case control study. J Dent Res. 1999. 78:457. Beck J, Garcia R, Heiss G, Vokonas PS, Offenbacher S. Periodontal disease and cardiovascular disease. J Periodontol. 1996 Oct. 67(10 Suppl):1123-37. [Medline]. Herzberg MC, Brintzenhofe KL, Clawson CC. Aggregation of human platelets and adhesion of Streptococcus sanguis. Infect Immun. 1983 Mar. 39(3):1457-69. [Medline]. Dorn BR, Dunn WA Jr, Progulske-Fox A. Invasion of human coronary artery cells by periodontal pathogens. Infect Immun. 1999 Nov. 67(11):5792-8. [Medline]. Chung HJ, Champagne CME, Southerland JH, et al. Effects of P. gingivalis infection on atheroma formation in ApoE(+/-) mice [abstract]. J Dent Res. 2000. 7:313. Gaydos CA, Summersgill JT, Sahney NN, Ramirez JA, Quinn TC. Replication of Chlamydia pneumoniae in vitro in human macrophages, endothelial cells, and aortic artery smooth muscle cells. Infect Immun. 1996 May. 64(5):1614-20. [Medline]. Castell JV, Andus T, Kunz D, Heinrich PC. Interleukin-6. The major regulator of acute-phase protein synthesis in man and rat. Ann N Y Acad Sci. 1989. 557:87-99; discussion 100-1. [Medline]. Lopes-Virella MF, Virella G. Immunological and microbiological factors in the pathogenesis of atherosclerosis. Clin Immunol Immunopathol. 1985 Dec. 37(3):377-86. [Medline]. Noack B, Genco RJ, Trevisan M, Grossi S, Zambon JJ, De Nardin E. Periodontal infections contribute to elevated systemic C-reactive protein level. J Periodontol. 2001 Sep. 72(9):1221-7. [Medline]. Lagrand WK, Niessen HW, Wolbink GJ, Jaspars LH, Visser CA, Verheugt FW, et al. C-reactive protein colocalizes with complement in human hearts during acute myocardial infarction. Circulation. 1997 Jan 7. 95(1):97-103. [Medline]. Schaefer AS, Bochenek G, Jochens A, et al. Genetic evidence for PLASMINOGEN as a shared genetic risk factor of coronary artery disease and periodontitis. Circ Cardiovasc Genet. 2015 Feb. 8 (1):159-67. [Medline]. Sanz M, Beighton D, Curtis MA, Cury JA, Dige I, Dommisch H, et al. Role of microbial biofilms in the maintenance of oral health and in the development of dental caries and periodontal diseases. Consensus report of group 1 of the Joint EFP/ORCA workshop on the boundaries between caries and periodontal disease. J Clin Periodontol. 2017 Mar. 44 Suppl 18:S5-S11. [Medline]. Rodríguez-Iturbe B. Epidemic poststreptococcal glomerulonephritis. Kidney Int. 1984 Jan. 25 (1):129-36. [Medline]. Rastaldi MP, Ferrario F, Yang L, Tunesi S, Indaco A, Zou H, et al. Adhesion molecules expression in noncrescentic acute post-streptococcal glomerulonephritis. J Am Soc Nephrol. 1996 Nov. 7(11):2419-27. [Medline]. Reichert LJ, Huysmans FT, Assmann K, Koene RA, Wetzels JF. Preserving renal function in patients with membranous nephropathy: daily oral chlorambucil compared with intermittent monthly pulses of cyclophosphamide. Ann Intern Med. 1994 Sep 1. 121(5):328-33. [Medline]. Remuzzi G, Ruggenenti P, Benigni A. Understanding the nature of renal disease progression. Kidney Int. 1997 Jan. 51(1):2-15. [Medline]. Rodríguez-Iturbe B, Rubio L, García R. Attack rate of poststreptococcal nephritis in families. A prospective study. Lancet. 1981 Feb 21. 1(8217):401-3. [Medline]. Ruiz JG, Lowenthal DT. NSAIDS and nephrotoxicity in the elderly. Geriatr Nephrol Urol. 1997. 7(1):51-7. [Medline]. Savage CO, Pusey CD, Bowman C, Rees AJ, Lockwood CM. Antiglomerular basement membrane antibody mediated disease in the British Isles 1980-4. Br Med J (Clin Res Ed). 1986 Feb 1. 292(6516):301-4. [Medline].